In addition to his roles as founder and board chairman of the Brandywine Conservancy, land and historic preservationist, George A. “Frolic” Weymouth (1936-2016) was a highly talented artist. This landmark exhibition of approximately 65 of Weymouth’s best works of art in all media will reveal the breadth of his visual investigations. From the loose, energetic style and monochromatic palette of Weymouth’s early oils in the 1950s, the mature artist, mentored by his close friend Andrew Wyeth, used the mediums of watercolor and egg tempera to create haunting, hushed landscapes and powerful portraits. 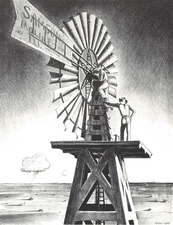 Peter Hurd's 'The Windmill Crew' (1936, lithograph). The Andrew and Betsy Wyeth Collection. Much less well known than his paintings, Hurd’s prints reflect a brief period of his life’s work in the 1930s, when he turned to lithography to support his young family during the Depression. During this period, Hurd split his time between San Patricio, in his native New Mexico, and Chadds Ford, the family home of his wife, the artist Henriette Wyeth. Though he worked on many of the prints in Pennsylvania, nearly all of them represent scenes of ranch life in New Mexico. The exhibition will feature 24 of Hurd’s rarely seen Southwestern lithographs, as well as a selection of his drawings and temperas of similar subjects from the same period which will provide insight into his artistic process. 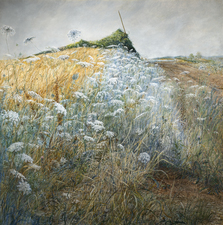 The artist Peter Hurd is often noted for his experiments in egg tempera painting, and particularly for introducing Andrew Wyeth to the medium with which he would become so closely associated. An inquisitive artist, Hurd taught himself not only the traditional methods of tempera, but also the late 18th-century printmaking technique of lithography. 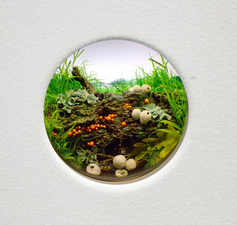 Patrick Jacobs 'White Puffballs with Orange Slime Mold and Lichen' (2015, mixed media diorama). Courtesy the West Collection, Oaks, Pa.
“Natural Wonders: the Sublime in Contemporary Art” will showcase the work of a dozen major American artists – Suzanne Anker, Lauren Fensterstock, Patrick Jacobs, Maya Lin, Roxy Paine, Miljohn Ruperto & Ulrik Heltoft, Diana Thater, Jennifer Trask, Mark Tribe, Kathleen Vance, T.J. Wilcox, and Dustin Yellin. These works conjure the raw power and unruliness of nature along with its harmonious effects. Artists since antiquity have depicted, and often mimicked, the splendors of nature. Throughout the centuries, such representations have embodied the shifting relationship between humans and their natural surroundings. Artists in this century have continued this cultural dialogue with nature, and as this exhibition will reveal, expanded it in surprising ways, bringing their distinct concerns and creative vision to the subject. These works harbor pressing concerns beneath their alluring surfaces, and the exhibition’s selection will raise a number of key issues involving our relationship with the natural world, including species extinction, over cultivation of wilderness, GMOs and designer breeding. Mark Tribe will present for the first time in North America his “New Nature” series of 4K video stills drawn from wilderness preserves in the United States. As a continuation of that series, “Tribe” will explore locations protected by the Brandywine Conservancy (sister organization of the Brandywine River Museum of Art) to develop a video portrait based on those properties. A component of the project will be a site-specific commission by Kathleen Vance, whose installation in the atrium of the Brandywine – the museum’s first – will offer an extension of themes explored within the exhibition galleries. Vance will create a 25-foot-long recreation of the Brandywine River, with flowing water, in the atrium, translating the topography of the actual river visible through its windows. A little-recognized aspect of the work of Winslow Homer is the relationship between his painting and photography, and the role of the relatively new medium on his approach to image making. In 2014, the Bowdoin College Museum of Art (BCMA) was given an English-made camera that once belonged to Winslow Homer. This object was a catalyst for an exhibition organized by BCMA co-director Frank H. Goodyear and Bowdoin College assistant professor of art history Dana E. Byrd. The Brandywine River Museum of Art will be the exhibition’s second and only other venue. The exhibition will examine the roles photography played in Homer’s evolving artistic practice. As a young artist for Harper’s Weekly during the Civil War, Homer utilized photographs as source material for some of his drawings. Alexander Gardner’s famous photograph of Lincoln’s first inauguration, for example, provided Homer with the pictorial information he needed to construct his own detailed view of the event. For his Civil War paintings, such as “Sharpshooter” (oil on canvas, 1863), graphic war photography helped him to think more deeply about what he’d seen, and about how to combine personal sight and engagement with a wide range of sources for composition development. After the Civil War, Homer traveled to locations in the eastern United States that were becoming popular as tourist destinations – the White Mountains of New Hampshire, the Catskills and Adirondacks of New York, and Cape Ann in Massachusetts. He was introduced to a new type of photography – imagery to promote tourism. During the last three decades of his life, he often created compositions of the same subject in different mediums including printmaking and photography, a cross-fertilization that came from his long interest in probing the way things look and the challenge of portraying them realistically. The exhibition is drawn from the BCMA’s holdings of Homer’s art and archival materials, and from more than 20 major lending institutions. It will feature approximately 50 photographs created or collected by Homer and approximately 50 paintings, prints, watercolors, and drawings from all major periods of the artist’s career. For more information, visit www.brandywinemuseum.org.